Adam already posted that iTunes 7.2 and iTunes Plus went live, but I don’t think the actual functionality was live when he made the post. Here are a quick look and a few points I’ve noted with the new iTunes features. I’m sitting here, late Tuesday night (5/29), prepping the next Maccast late and Software Update just reported that a new version of iTunes 7.2 (34) was available. According to Software Update, “With iTunes 7.2 (you can), preview and purchase iTunes Plus musicâ€”new higher-quality, DRM-free music downloads from participating music labels.”. Cool, but there are two interesting things to note about this sentance… 1) Apparently DRM-free higher quality tracks will from now on be know as “Plus” music and 2) it doesn’t specifically mention “plus” tracks as being tied to EMI. The term “participating music labels” seems to imply that there are tracks from other labels available. Of course, I instantly ran the update and immediately began browsing the store for the new tracks. So far I can find no higher quality DRM free tracks available from any label, let alone EMI. I guess Apple still has yet to update the iTunes Store, but hey, they have 2 more days before May has ended so I guess there’s still time. This bin is in the entryway of Microsoft’s Zune Headquarters and is there to encourage employees to recycle their iPods in favor of a Zune. 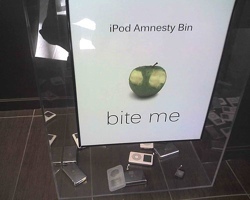 This picture was recently posted to Flickr and apparently some Mac sites, like MacWorld UK are saying the bin represents , “child-like and unrealistic behavior”. I think it’s actually kind of funny for two reasons… First, I like that Microsoft has picked a clever and funny way to take jabs at their competition. Let’s face it, it’s not easy to be taking on the most popular music player in the world. Things like this might serve as a rallying point for the Zune team boosting morale. Secondly, and what made me chuckle more, is how pathetically large the bin is in relation to the iPods it contains. I guess the management was a little more optemistic about their employee’s willing to trade their iPods for a Zune. Note that most, if not all, of these iPods seem to be older units. I don’t think I see a single 5th gen in there, do you? Not much to see yet, but we do have a few details. What I’m not clear on is the specs here—if you look above, it reads as if the iPhone is only a US dual-mode phone (operating on the 850 and 1900Mhz frequencies), and not a quad-band or world phone (operating on the 850 & 1900, and 900 & 1800Mhz frequencies). But this is probably just because in the US, 900 and 1800 are not used for mobile/cellular phone purposes, so maybe the FCC doesn’t require manufacturers to submit tests on the frequencies the device is capable of using, only the frequencies the manufacturer intends the device to use in the US. If you have more info on this, please leave a comment below. You can read all about GSM frequencies on Wikipedia, too. The other day I needed to run to my local Apple store in Oak Brook, Illinois (The one in Orland Park is not open yet, but I digress) to pick up some A/V cables for the good old iPod and of course drool at all the new Mac stuff. I have been in a few Apple stores and they are generally set up the same with the high end production software to the left of the register and the games, GarageBand loops, etc to the right. I was perusing the latest additions to the Mac gaming world and over heard one teenager complain with a friend about the price of a game that is at least two years old, the name of the game I cannot recollect. He stated that the game was two years old, was already in the bargain bin at a local â€œBig Boxâ€ store, and was more than fifty percent cheaper. The question was; â€œWhy should I pay more for something I can get for less?â€ His friend, who obviously was a Mac owner, looked around the store like a person who had just been publicly humiliated as his friends tone carried throughout the store. The Mac owner quickly retorted that playing on a Mac is better than playing on the PC. At this point I was pretending to be interested in a foreign language teaching app so as to be discreet and not be seen being nosy. I had to hear the Mac owners reasons, I have my own but thought they would be different. Iâ€™m not going to say at this point that the friend went right up to the register and bought a Mac, but I will say that he was intrigued. He at least went up to one of the Mac specialists and asked questions about the graphics cards that came with them, and other options that could be had. He may never own a Mac, but he will at least know why itâ€™s fantastic to play games on the Mac. Think about it this way, the game you are purchasing may be two years old, but itâ€™s has had patches and has had bug fixes that were not done at the very beginning, so in most cases you are getting the best product and not worrying if the program will crash. Because our PC friends have done all the beta testing for the Mac version for us. Chances are that if you’re an Apple fan, you’re also heavily into some form of media. Whether it be music, movies, games, or books you probably have a couple shelves of boxes and discs scattered throughout pouches. Then there are always those friends borrowing your stuff though you know neither of you will remember who has it and if they gave it back. Delicious Library manages what you have, keeps track of where it is, makes recommendations for new content, and looks cool in the process. Depending on how much content you have, it can take quite some time to get your entire library scanned. This process can be more enjoyable than you might think, as Delicious Library offers you several ways of scanning in your media. The fastest, but probably the most boring way of going about it would be to type out the UPC or title of your product. A more interesting way would be to set up your iSight or webcam and hold the product’s barcode in front of it. The seemingly coolest, yet most expensive way scan your content would be to order their FlicÂ® Wireless Laser Barcode Scanner (US $174.95 and only available while buying a license). It connects via Bluetooth, works up to 50 feet away from your Mac, and can store up to 500 unique barcodes if you’re out of range. Finally, you can also use a USB barcode scanner. In fact if you have an old USB CueCat laying around you can modify it to work with Delicious Library in under a minute. A podcast about all things Macintosh. For Mac geeks, by Mac geeks. NAB Special. A special edition of the Maccast where I sit down with two Mac Pro and discuss their impressions and reactions to NAB 2007. First I talk with Craig Syverson, from Gruntmedia and we the new updates to Apple’s FinalCut Studio 2 product. We also chat about Apple’s market strategy for Pro video along with some of Craig’s impressions of some other great products announced at NAB. Then I sit down and have a conversation with the Maccast’s own Pro adds guru, James Alguire (Inkdrop Media). James writes the “Stuff, Guts, and Video” articles here on Maccast.com and I ask him what new FinalCut features make it worth the upgrade cost. James and I discuss Adobe’s return to video editing on the Mac and both Adobe’s and Microsoft’s new web video and multimedia applications. 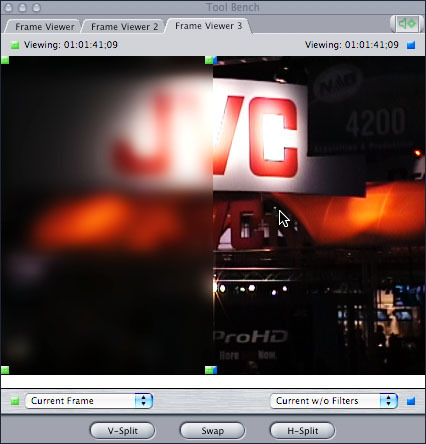 In addition, I also get James take on some of the products and highlights from this years NAB show.